The Waterford man is confident he can post a faster 400m hurdle time in Thursday’s final. 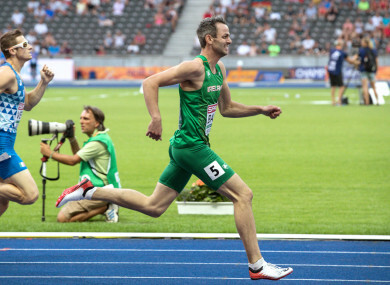 IRELAND’S THOMAS BARR produced a strong finish to earn automatic qualification in this evening’s 400m hurdle semi-finals at the European Championships in Berlin. The Waterford man briefly looked in a spot of trouble, dropping to fourth before banishing any doubt and showing his speed endurance during the final 100 metres to comfortably take second place behind an impressive run from Turkey’s Yasmani Copello. The 26-year-old’s 49.10 is the seventh-fastest time recorded over the three semi-finals, with Norway’s Karsten Warholm leading the way on 48.67. However, putting his slightly sluggish opening down to an uncharacteristic touch of nerves, Barr is confident he can run much faster when the European final goes under the gun at 19.15 on Thursday evening. “The aim was to come out and qualify for the final so there was a bit of pressure on me, expectation,” Barr told RTÉ’s David Gillick immediately after his run. Email “'I knew I had strength there and I used it': Thomas Barr finishes strong to power into European final”. Feedback on “'I knew I had strength there and I used it': Thomas Barr finishes strong to power into European final”.